GuitarTricks.com is holding another song fund promotion. 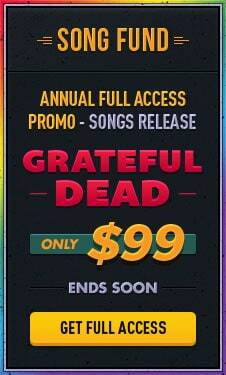 They do this a few times per year, in order to raise quick cash to pay for licensing a new batch of songs. These are classic rock songs, but if you're reading this, I'm sure you already knew that. The tutorials will teach you how to play these songs note for note, so if you are a Grateful Dead fan, you'll absolutely want to have a look at these new lessons. But of course, there are other popular songs being added to GuitarTricks right now as well. With the addition of these, and several new song lessons, GuitarTricks has over 11,000 video tutorials, out of which, 600 are on songs. That's a lot of lessons, more than anybody could consume in a lifetime. But of course, all guitarists will lean towards a few given styles of music, so you might not be that interested in learning heavy metal guitar, or classical. It really depends on what type of music you like listening to. If you want to find out a bit more about what GuitarTricks is, and weigh your options with regard to which guitar lesson website to sign up with, have a look at our comparison of Jamplay and Guitartricks. It will show you the customer area of both websites, and explain what they are all about in detail.